This is one of the better priced 4K TVs in the market right now. Even though it doesn’t have some of the fanciest features like the cinema screen design and Harmon Kardon speaks, it still boasts some necessary enhancements such as the easy to use and ultra cool Magic Remote, and a TruMotion 240Hz refresh rate. And, most importantly, it is better priced than most 4K LED TVs in the market. There are some nice upgrades on this TV in comparison to its predecessors, such as IPS panel for better side viewing angle and increased brightness, Ultra Clarity for better motion blur reduction, and four HDMI 2.0 inputs. Typically for LG, the integrated audio quality is really good. Another high point is HD to 4K upscaling since native 4K content isn’t widespread just yet. IPS 4K panel improves the overall picture performance, but also makes the contrast and colors on this TV appear more consistent when viewing from side angle. There are many other technologies included in the LG Electronics 65UF7700 for enhancing the overall picture quality, such as Ultra Luminance for improving the brightness, Tru Color Generator for improving the color reproduction, Tru Black Control for improving deep level, and more. Finally, one important highlight of this great TV is its amazing smart features. Here’s a closer look to some of the most important 65UF7700 features. This TV boasts nice clean lines as well as a small, half inch bezel frame. The LG Electronics 65UF7700 is very thin, and its design is great. The stand is wide, and it is not stable – it moves back and forth when you push it. This TV doesn’t feature the enhanced Harmon Kardon speaker package, but its sound quality is still better than most of the flat screen televisions on the market. Probably the best choice for settings would be the Clear Voice II setting. The video engine is probably the most important component of every 4K UHD TV, especially the ability to upscale/upconvert certain resolution to the panel’s native resolution. The lack of 4K content is most likely going to continue for some time in the future, so stellar upconverting all sorts of HD resolutions 480p, 720p, and 1080p is vital. LG ranks somewhere in the middle of the pack in this category as there are certain processing artifacts with lower 720p and 480p signals. The detail and clarity to show off native 4K resolution is better with higher HD resolution. On the downside, we must mention the lack of 3D compatibility on the LG Electronics 65UF7700, which is pretty surprising especially for a high end television like this one. LG has done a really good job in speeding its Smart TV function with the original webOS, and now with the webOS 2.0. The interface layout is more intuitive and much simpler, and loading is pretty faster. You are now able to sort your favorite programs really easy thanks to the point and click operation on the amazing new LG Magic Remote. It allows you to organize as well as access your apps with ease. The webOS 2.0 operating system is powered by an amazing quad core processor. 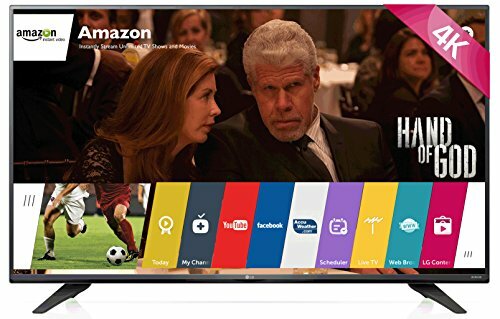 Smart TV options include Amazon, Netflix, YouTube, Showtime, HSN, iHeart Radio, and newly DirecTV, Drama Fever, and GoPro. The GoPro Channel App is available just to LG webOS, and it allows the owners of LG TVs to stream GoPro videos on-demand. This channel plans adding 4K content soon. Overall, LG keeps things simple and easy. Instead of a home screen that has tons of buttons, this TV provides you with nice colored strip over the bottom of the screen filled with your favorite apps as well as the LG store. You can see your open applications by clicking the left arrow on the screen, and all the applications downloaded to your TV by clicking the right arrow. Switching between apps is impressive and instantaneous. Also, the buffering times of any streaming content are significantly reduced, so the only thing left to say is that the move to a webOS based operating system was a great move on LG’s part.